Perhaps your New Year’s resolution was a garden based one? Is this the year you’re finally going to get around to tackling the job you’ve been promising yourself for months or years?! If 2019 is the year you’re destined to update your garden, why not take inspiration from some of our stunning Outdoor Water Features! Whether you love a contemporary style space, or if your back garden is more to a traditional taste, there are tonnes of great water features to choose from on our website, to compliment any home or garden! As we approach the new gardening season, many products will be returning to stock, so as the sunshine and warmer weather starts to arrive, keep checking our UK Water Features website for lots of exciting new products and returning favourites! To add natural and rustic charm to your garden, why not try something like our Granite Babbling Bowl Feature? Constructed from natural granite, this feature will instantly add a modern feel to any space! Once the product is installed the base can be covered in slate or rocks to help it blend right into the rest of your garden! To add a classic feel to your garden, a tiered fountain can do just the trick! Perfect for traditional garden and those with an English country garden style, this could be just the addition your outdoor space needs to add something special this gardening season! Our Cast Stone Tranquillity Fountain or our Cast Stone Jubilee Vase Fountain are both manufactured from premium quality cast stone and will be perfect to place on a patio or nestled into the garden. Just sit back and relax and enjoy the relaxing sounds these features create. Our Stainless Steel Sphere Water Features are one of our most popular styles, here is our 50cm model looking lovely nestled amongst pebbles and greenery. The shiny surface looks stunning all through the year and reflects the sun beautifully in the summer! It is a fully self-contained water feature that is easy to install and maintain, a stunning addition to your garden this year! For a rustic yet modern touch, why not try one of these features? Our Rainbow Twisted Stone Feature and our Petal Pool Fountain Water Feature add attractive decoration to your space as well as relaxing trickling sounds and are perfect designs for contemporary gardens. Due to their natural finishes these would look great in more traditional gardens too, and are both made from durable stone, so you know they are built to stand the test of time in your garden! For another classic feel but to add almost a Mediterranean vibe to your outdoor space, why not take a look at one of our Pots and Troughs features like our Open Pouring Pots Feature? Perfect for indoor or outdoor use, you could enjoy this feature out in your garden for most of the year, then bring inside to enjoy through the winter! With built in warm white LED lights that will illuminate the feature during the night, this will be a fantastic addition to any home or garden and will add something special to any space! Get the look of a sandstone boulder water feature without the price tag! This fantastic 6 Tier Sandstone Boulder Water Feature is actually made from durable poly-resin so is easy to transport but looks just as effective as the real thing! It also has 5 built in white LED lights so is a gorgeous addition to your garden that can be enjoyed in both the day and night! Ideal for adding a sense of calm and tranquillity to your garden! If you have a Garden Pond you’d like to add something special to, why not try our Floating Fountain with Colour Changing Lights. This dramatic floating fountain with built in colour changing LED lights is ideal for creating a high impact water feature from a garden pond, and the removable colour changing lights can be operated separately to use at night for a more dramatic effect. Bound to impress family, friends and neighbours! 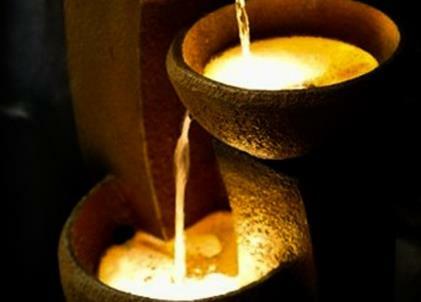 As well as our fantastic range of Outdoor Water Features, don’t forget about our Water Feature Lights that can help to make your new water feature even more spectacular, as it’s illuminated during the night time! We hope this peek at just a handful of features we have available will inspire you to add one to your outdoor space this upcoming gardening season. As you can see we stock a wide range of styles that can cater to any taste, size of garden and budget, so why not head over to our UK Water Features website to view all the above features an many, many more! Make 2019 your gardening year!